I debated whether or not to give this book a 2 or 3 star review. It rated somewhere between "ok" and "liked it." If a 2.5 was possible, that's what I would go with. There were several moments of humor and quirky interactions that I was able to pick out of a storyline that dragged a bit, and those moments saved the book for me.The actual story was interesting, but it was buried somewhat in between constant references to how plain, different, and alpha the heroine was. It got a bit tiring to see the same descriptions over and over.Another thing that disappointed me a bit was that I was expecting this book to be a collision of steampunk and the paranormal. The story didn't have enough of either to completely satisfy me. The author had an imaginative concept to treat the paranormal as part of society, instead of an element hiding in the closet. 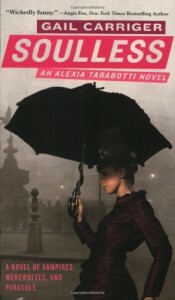 I give her credit for trying out a different take on the paranormal, but it didn't hold my interest as much as it could have for some reason.The story felt more like Scotland Yard meets Victorian sensibilities and etiquette rather than the author's own description of a different take on Urban Fantasy. If the book had read more like the actual back cover description, I would have enjoyed it much more.